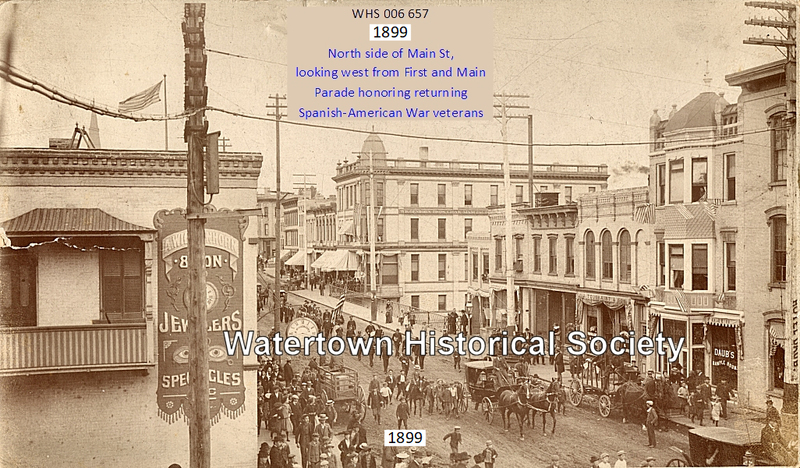 1858: William (Wilhelm) Wiggenhorn (1797 – 1876) came to Watertown directly from Germany in the year 1848, and for some years was landlord of the Buena Vista House. 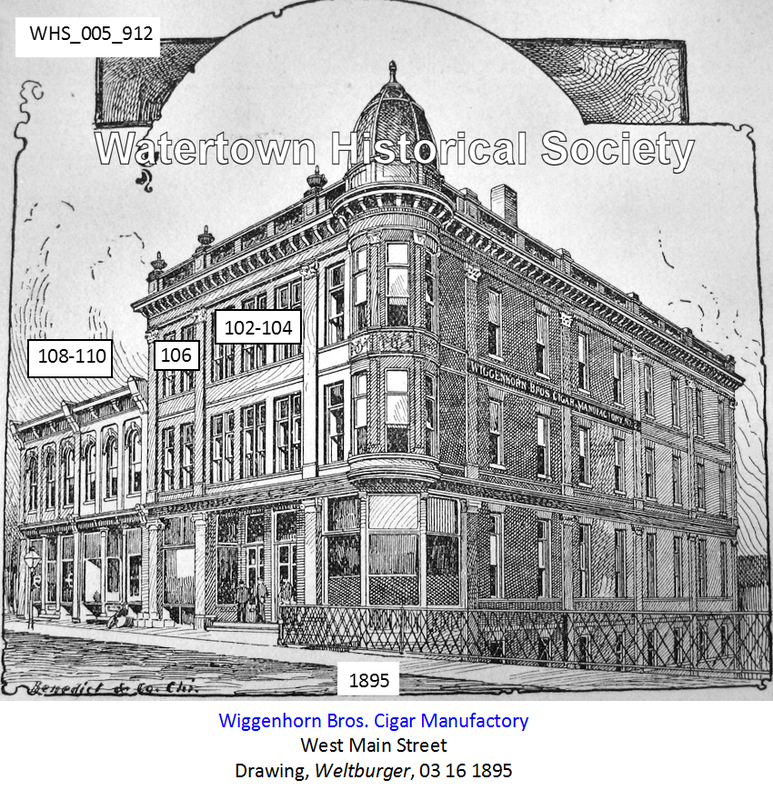 New wholesale and retail cigar and tobacco store, post office block, Second Street, of E. Wiggenhorn. JULIUS WIGGENHORN HOME, 510 CLYMAN ST.
04 02 EMPTY CIGAR BOXES MUST BE DESTROYED. 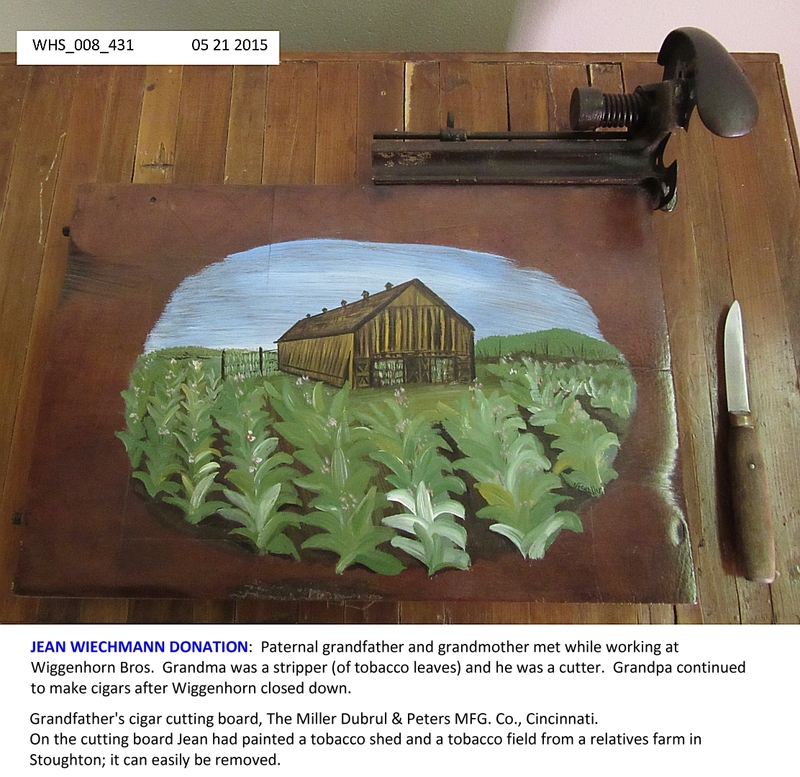 After having served in the capacity of foreman of Wiggenhorn Brothers’ cigar factory for a period of thirty-two years, John Muth last Friday severed his connection with the above firm and retired from active labor, and will now enjoy the remainder of his days in the rest he so well deserves. Mr. Muth took leave of the men who had worked under him for so many years most affectionately and invited them to a “smoker” at William Dickoff’s place. Not one of the “boys" were missing, and the event was made a most memorable one. Nor were the girls employed in the stripping department forgotten by Mr. Muth, for they were royally entertained at Radtke’s ice cream parlor. The high esteem in which Mr. Muth is held was fittingly demonstrated by the gift of a handsome reclining chair from the cigarmakers, and a pretty foot rest from the strippers; and that his employers appreciated their old foreman was evidenced by the gift of a handsome gold watch. A service covering so many years certainly shows rare faithfulness for the company's interests and a little biographical sketch of Mr. Muth will be read with interest by our readers. Mr. Muth’s connection with cigarmaking dates back to his boyhood days when he began work as an apprentice, at the age of eleven years, and he has continued at the business ever since, with the exception of a few years during the Civil War. He was born in Birlenbach, Germany, October 16, 1838, and came to America with his mother when a infant two years old, landing at New Orleans. The family returned to Germany in time to celebrate his third birthday anniversary and again returned to New Orleans, reaching that city in 1848. 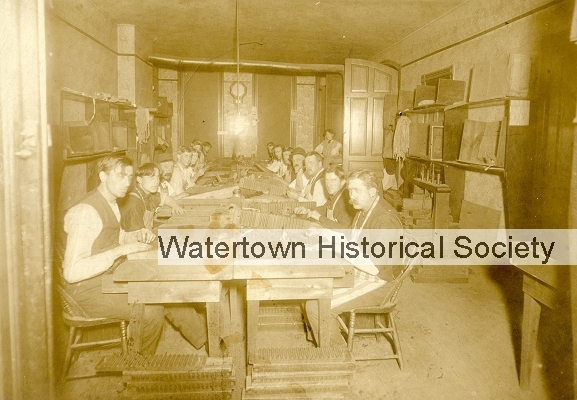 The family moved to Watertown the following year and Mr. Muth secured a position as apprentice in the cigar factory conducted by Rothe & Bernhard. 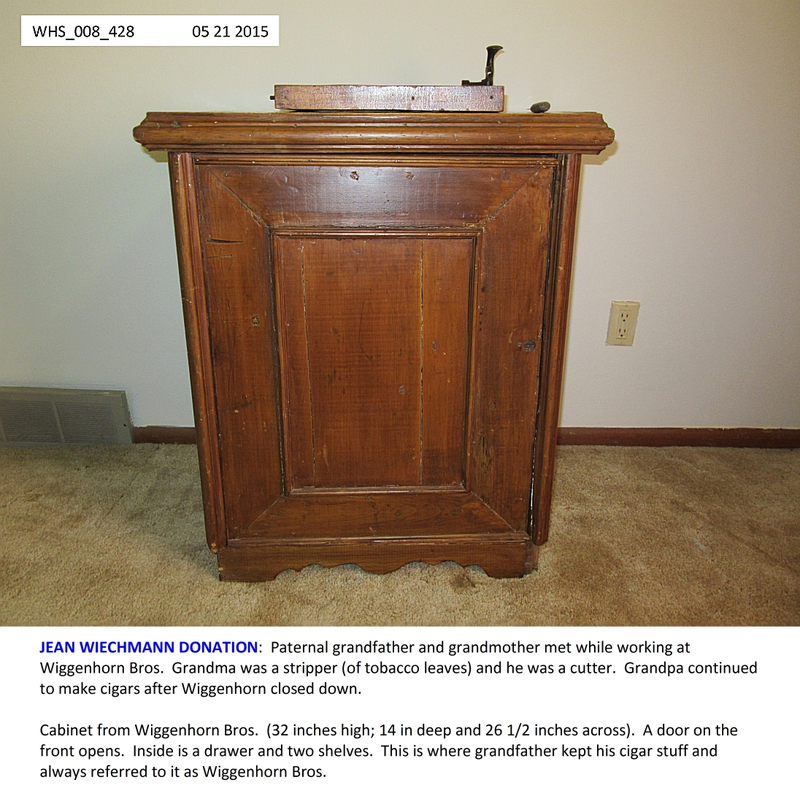 He later worked for Grossmann Bros, and in 1858 began work for Eugene Wiggenhorn, the business practically continuing until the present time. 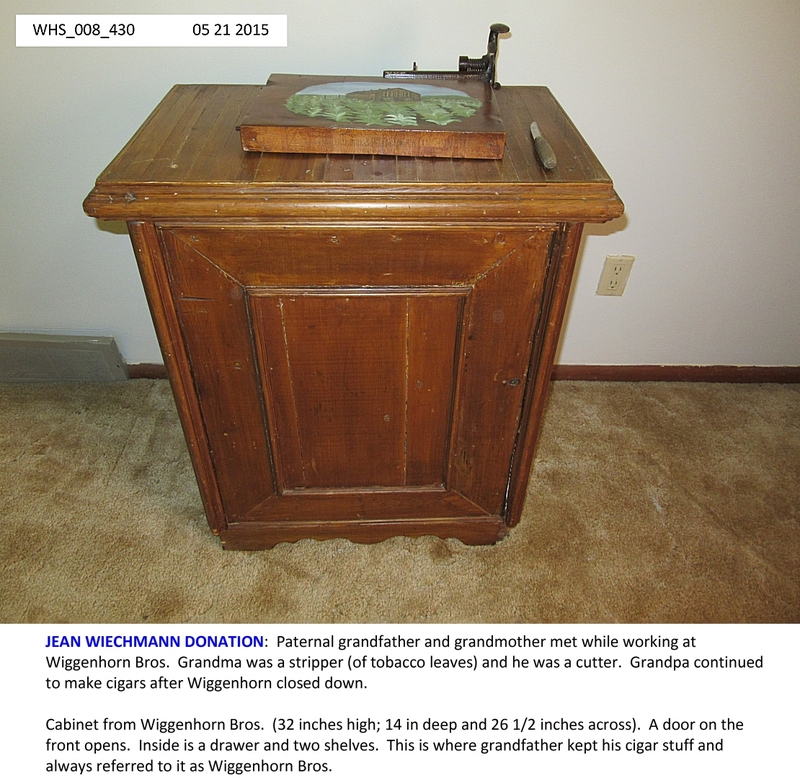 In March, 1862 he opened a factory for himself but after a few months sold to Eugene Wiggenhorn and enlisted in Co. E. 20th Wis. Infantry, August 10, 1862, known as Siegel’s regiment. He served during the war and was mustered out at Galveston Texas, July 14, 1865. 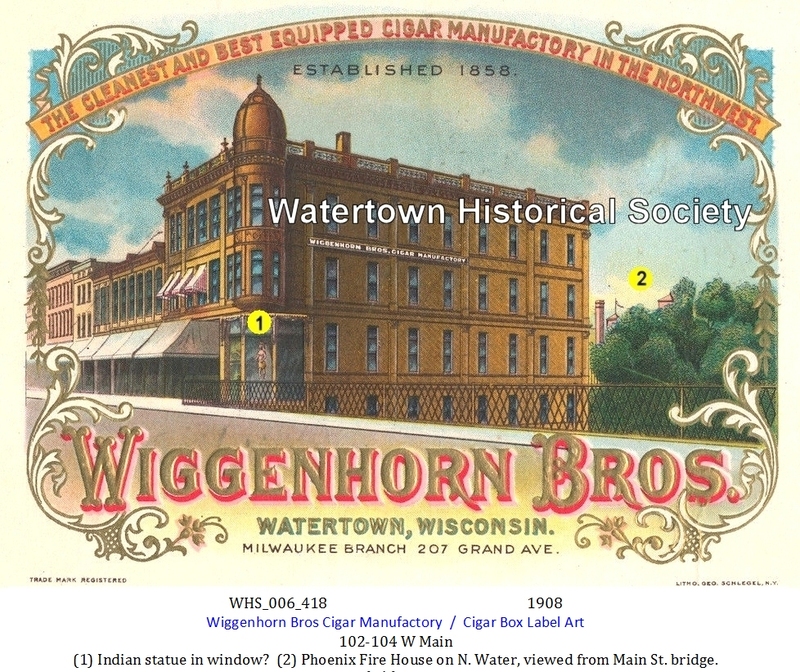 In 1869 he resumed work for Wiggenhorn Bros, as a maker and on May 10, 1873, was appointed foreman and has held that position ever since. He has practically been in the cigarmaking business fifty five years. The present force over which Mr. Muth has been foreman for so many years, consists of forty-eight men at the bench besides the strippers, and the oldest bench employee in point of years of service is John Kuester, who began as an apprentice in 1863 and still works there. In 1894, the firm erected the magnificent building now occupied. This is 50x106 feet, four stories high. The lower floor is used for storage purposes. The second floor is devoted to the office, shipping room and cigar storage. The third floor contains the manufacturing departments, and the fourth storage and drying room. The accompanying cut will give an idea of the exterior of the building. The interior is finished in a most attractive and convenient manner. An elevator connects all the floors, and the entire building is steam heated and electric lighted. It also has a complete waterworks system of its own. The sanitary arrangements for the convenience, comfort and health of the inmates of the building are complete, and cleanliness on the part of employees is one of the strict rules of the establishment, so that the cigars are entirely free from any contamination. 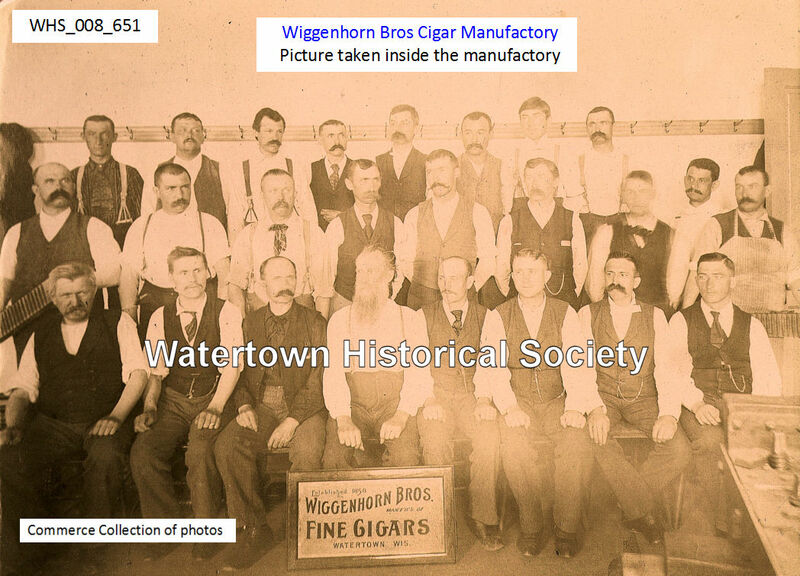 Wiggenhorn cigars are made in the same honest way today as in the pioneer days. The steady growth and enlargement of the business have not in one whit altered the firm's time-honored policy of putting nothing but honest value into their cigars. 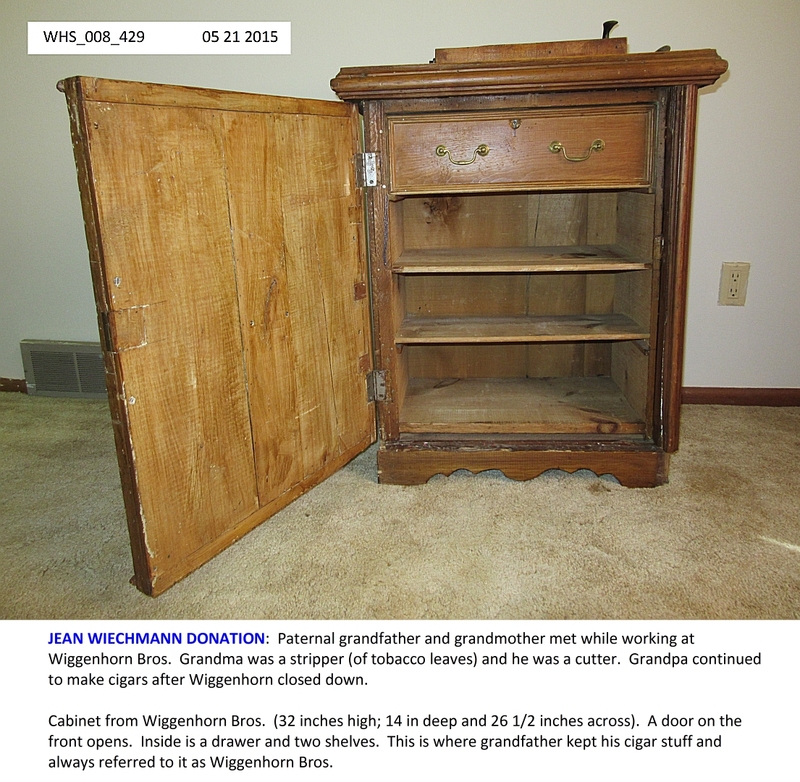 Competition and the deceptive blending of inferior tobaccos, practiced by many manufacturers and made possible by modern ingenuity, have not swayed the firm in their determination to give their customers the same honest Wiggenhorn quality, nor have they shattered their confidence in their customer's ability to appreciate quality. This statement can be substantiated when it is known that in a few years one of the latest products of the firm, Modern Flora, have had a sale of 50,000,000. The La Flora, the Commercial and the Latest Out and other well known and popular brands are made by the Wiggenhorn Bros. Co.
01 08 ALBERT FUERMANN, travelling salesman for Wiggenhorn Bros.
One of the saddest deaths that has occurred in this city for a long time was the sudden death of Mr. Frank Koch, a cigarmaker, 20 years of age who had his back broken while diving in the mill race back of the old electric light plant Wednesday evening, July 16. He lived but a few hours after the accident. 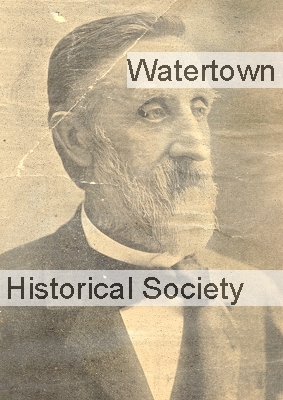 Mr. Koch was born in Watertown February 19, 1893. He was a member of the Imperial Band and the Schott-Millenkockel Orchestra. He sang in the choir of St. Henry’s church and was a member of St. Philip’s Society. He is survived by his parents, Mr. and Mrs. Frank H. Koch, three brothers and one sister. 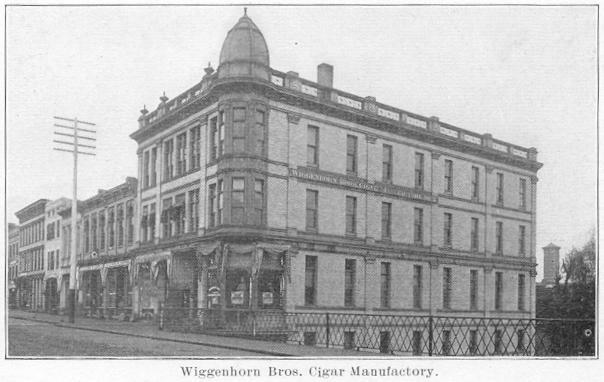 Among brands manufactured by Wiggenhorn Bros.
Had Wiggenhorn Bros., cigar manufacturers, remained in business in Watertown until August 1, they would have rounded out sixty years in business, but they were succeeded here a short while ago by the Westbound Cigar company, which will endeavor to build up a big business in this city for the jobbing trade. They need help and will employ 150 people here if they can be secured. The business was established sixty years ago  by Eugene Wiggenhorn, who upon his retirement a number of years ago, turned the business over to his brother, the late Constance Wiggenhorn. His sons, Julius and Guido Wiggenhorn, were admitted to partnership and have conducted the business until it was disposed of a few weeks ago. 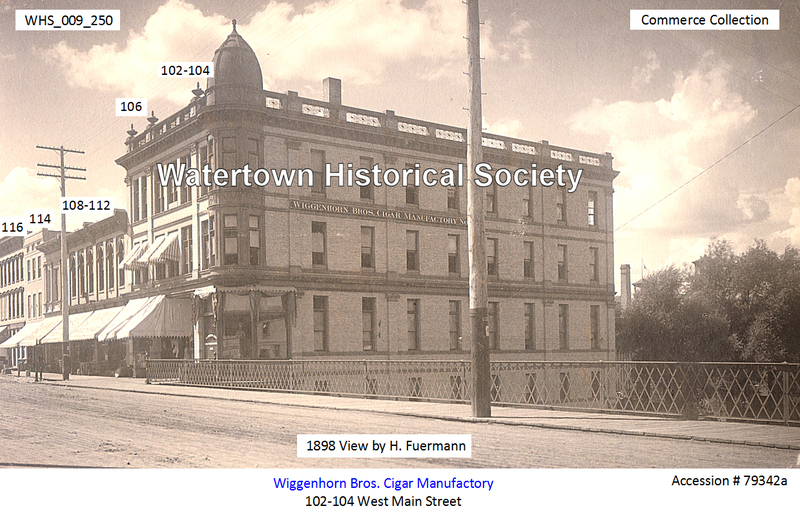 The factory was founded August 1, 1858, by Eugene Wiggenhorn. It was then located in the Buena Vista House. 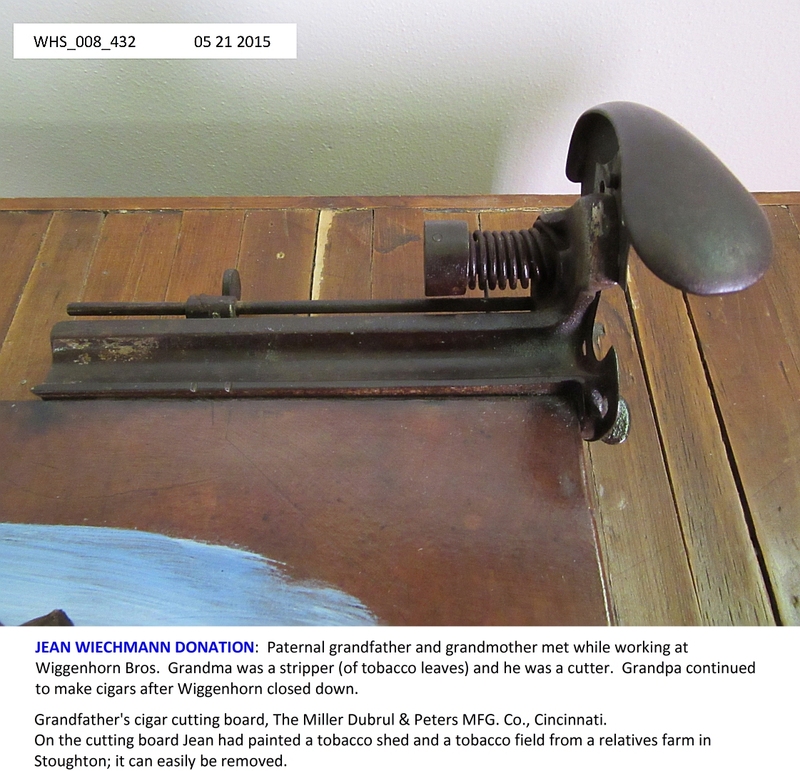 Mr. Wiggenhorn had served his apprenticeship with the firm of Kothe & Bernhard and launching into the business himself conducted it until 1864, when he took in as a partner, his brother, Constance Wiggenhorn, who died a few years ago. 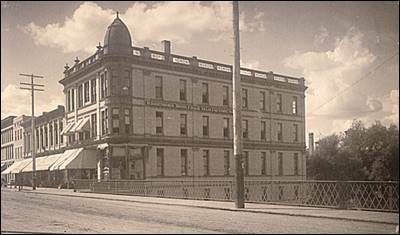 The new firm began business in the buildings at the corner of Market and Second streets, now occupied by Richard Geschke and Glaus & Jaeger. 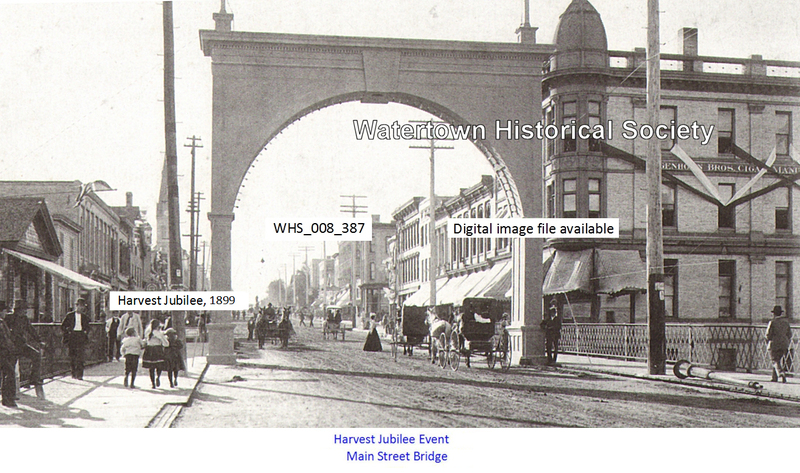 Here they remained until 1866, when they moved into the building at 103 West Main Street. 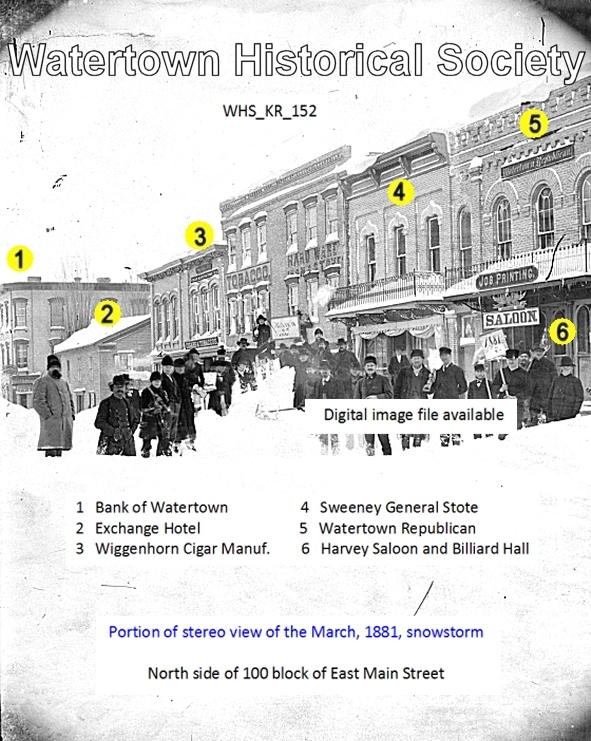 In 1868 the firm moved into the Fred Miller building in Main Street, between First and Second streets, and their increasing business compelled them to rent the upper floors of what was then known as the Chappell block. Here they remained until 1895 when they removed into their present quarters. 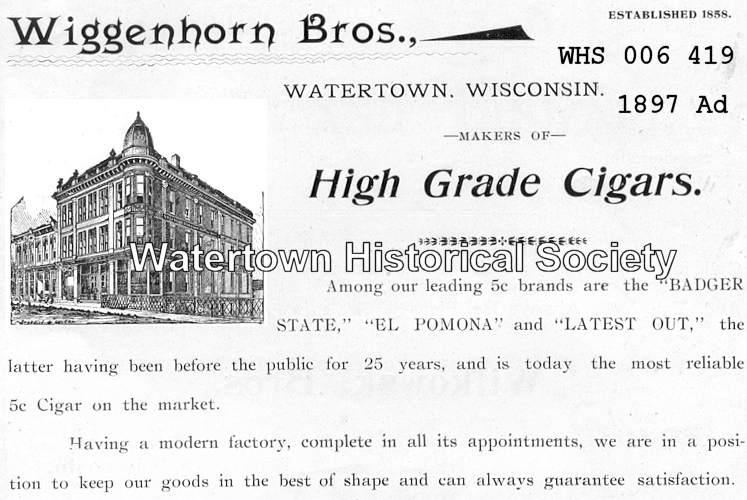 In January 1886 Eugene Wiggenhorn severed his connection with the firm and moved to La Crosse where he formed a partnership with John Pamperine in the cigar business. Windows on the 1st and 2nd floors on the east side of the building appear to have been widened in the 1920s. The two tin urns shown at the upper left of the roof-line are now part of the collections of the Watertown Historical Society. Items are too large for our public display spaces, but we are proud to care for them nonetheless. 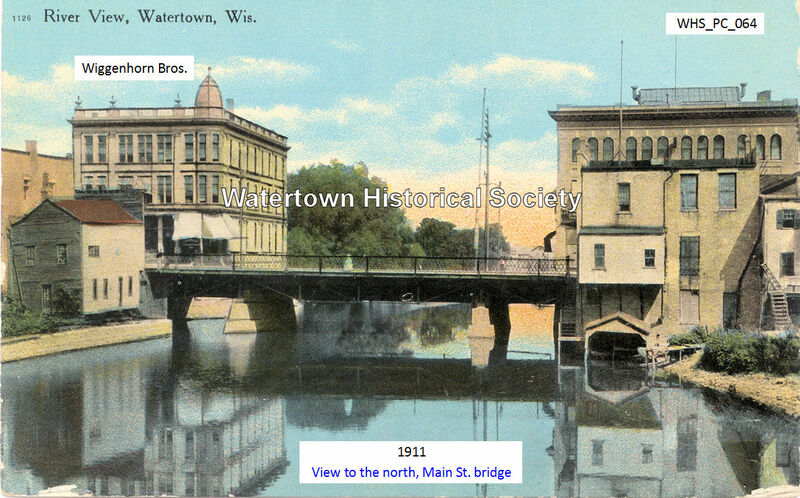 Another mural has been added to Watertown’s growing collection adorning the walls of downtown businesses. The newest addition was scheduled to go up this weekend on the side of the Golden Dragon restaurant at the corner of North Sixth Street and Main Street. 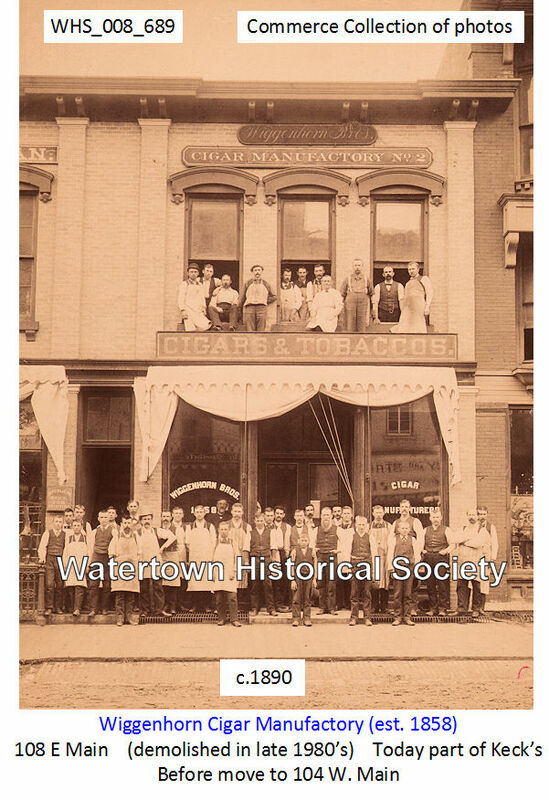 Watertown artist Gail Towers-MacAskill created the latest piece of wall art which highlights the history of Watertown’s cigar manufacturing industry. 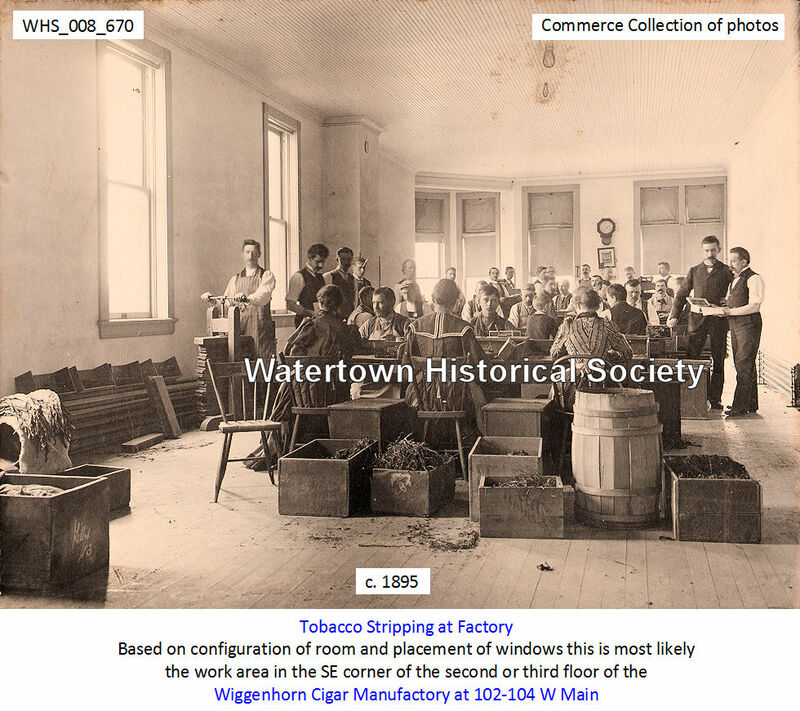 From a historical perspective, cigar manufacturing was a big part of the city’s society from the mid-1800s to mid-1900s, offering employment and pleasure to many. Originally tobacco grown in Pennsylvania and Cuba was used to create inexpensive, yet excellent quality cigars. 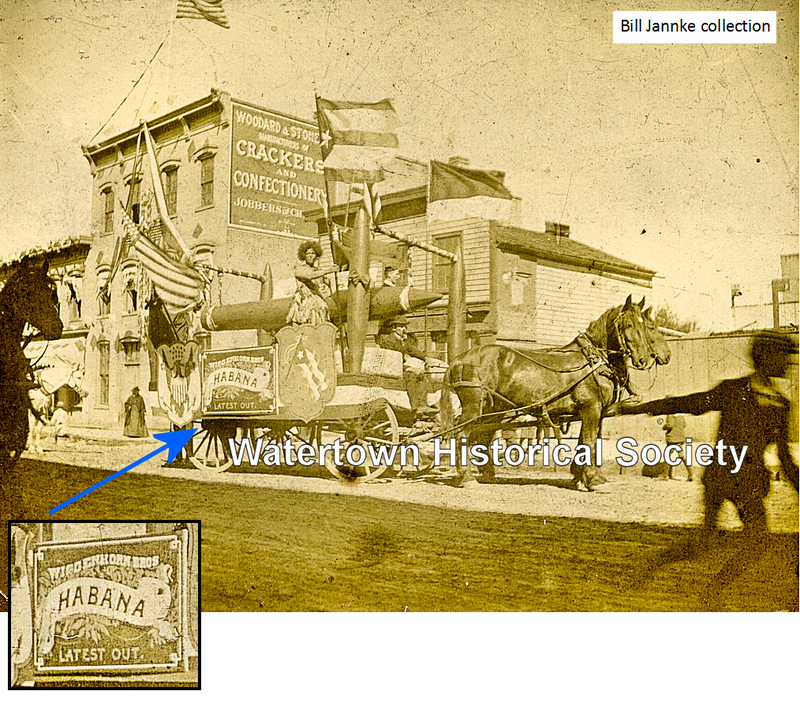 Later cigar manufacturers used native tobacco grown around Watertown. This tobacco eventually earned a reputation as the world’s best binder leaf. The binder leaf is the inner wrap of a cigar. Dr. E. J. Hoermann had dental offices in the Wiggenhorn building. 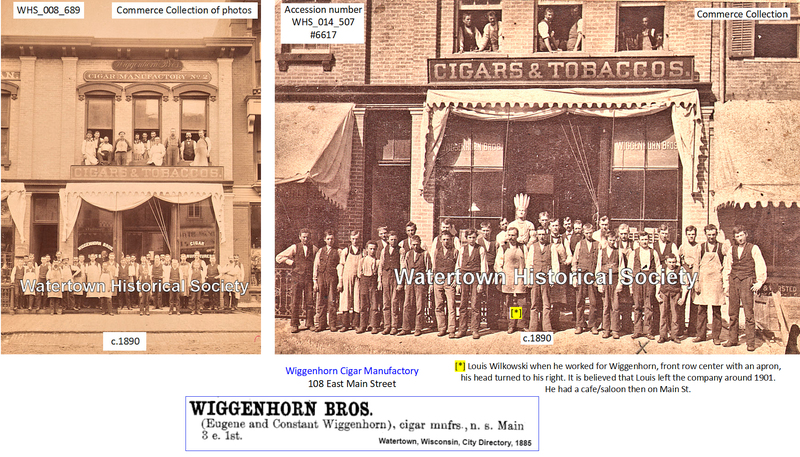 Eugene Wiggenhorn was the son of the famous Watertown Wiggenhorns. His father, William, owned and operated the Buena Vista House, now known as Loops, on N. Fourth St, in 1848, shortly after he arrived here with his family. 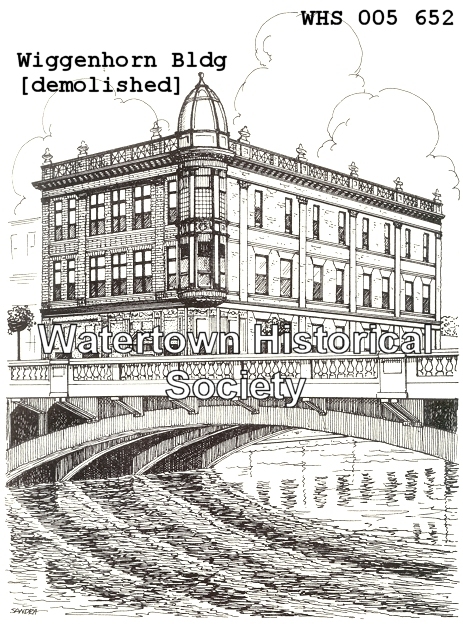 Look for more info on the family in the late Charles Wallman's book, The German-Speaking 48ers, Builders of Watertown. 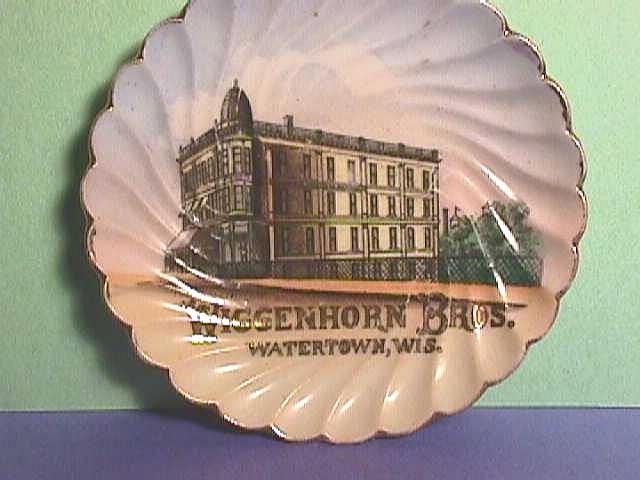 Wiggenhorn Bros Cigar Manufactory, 1890c, Souvenier plate. 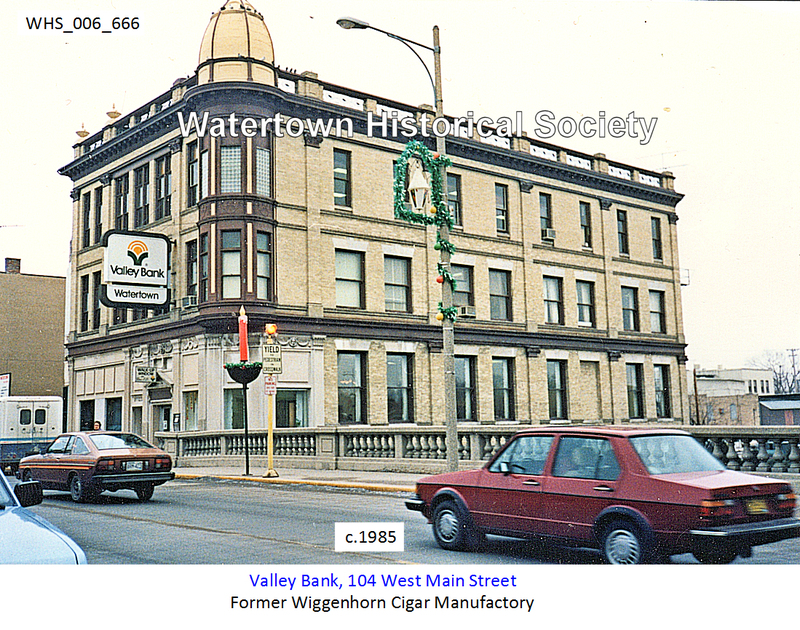 Back "The cleanest and best equipped CIGAR MANUFACTORY in the northwest, est 1858"
The old Wiggenhorn cigar factory, c.1895, NW end of Main St. bridge, became the Wisconsin National Bank, Valley Bank. Torn down in 1985 and Town & Country Bank constructed. 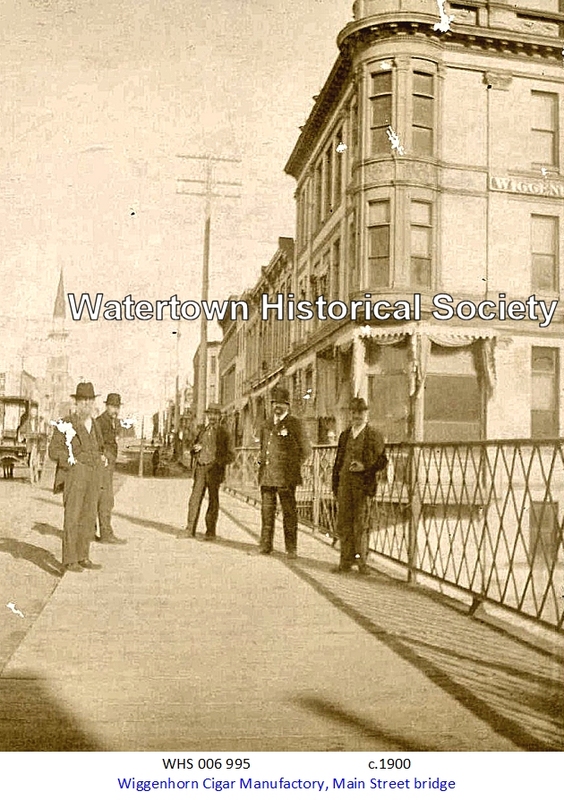 WTTN radio started in Wiggenhorn building, Dr. E. Allen Miller had his offices on the second floor, Mr. Clifford, the lawyer, had his office on the second floor and just before it was torn down the old Nickel & Dime Theatre Co. met on the third floor.